​Samrit is a place in which art isn’t needed. In the meanwhile, art is within the life there. The art of being attached to lands; The art of sensing weather; the art of approaching time; the art of communicating with people. The local people’s way of understanding reality is beyond verbal language, which is a beautiful piece of live art itself. 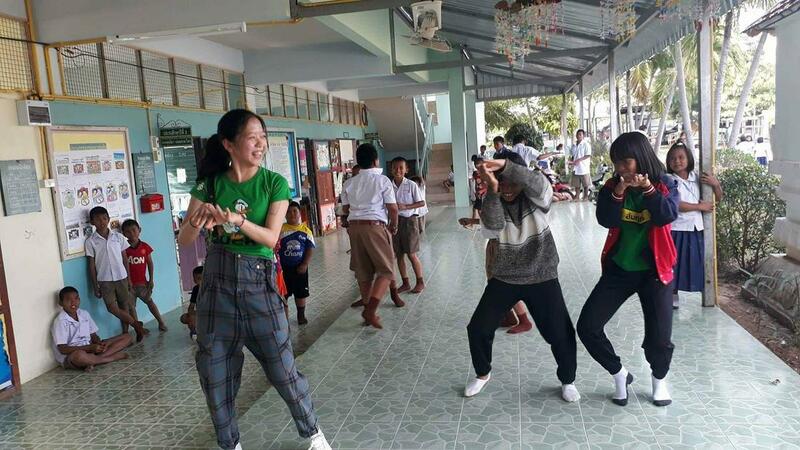 ​Because of the connection from Samrit residency, I’ve got insights about Isaan culture by participating to family events. 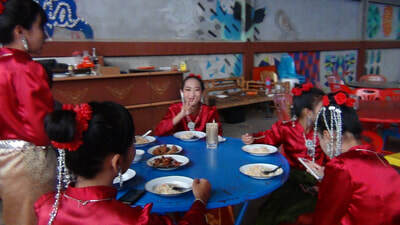 I was impressed by their food, Isaan pop and Lamvong dance. Moreover I was fully immersed in villagers’welcome curiosity and heart-warming care. As a performance artist, I found human relationship here is so fruitful that everyone could be a great performer on the stage which is called life. In their performance, there is an essential theme named joy. They drink when they enjoy. They dance when they enjoy. They sing when they enjoy. The stage is created when they enjoy. ​It is a very intriguing context, although sometime it is extreme for artists to produce works. Making process-based project requires lots of attention to communicate, especially when residency program aims to cultural exchange. If organization and coordination could have been done in more careful and delicate way, it would have helped reducing miscommunication between the local and artist. I am an artist who works with open manner, but requires a clear base in order to produce things. I do hope the residency could conduct their structure in a more sufficient way, for example, a cleaner studio, more efficient maintenance for facilities, more punctual schedule. Then in this alive village, Samrit residency and artists can surely make a great platform, on which diverse creativity can be openly exchanged. ​This precious experience had me constantly reflect on how my art practice could benefit not merely me, but also the community. The initial plan of my project was changed after those precious experiences. Luckily there was no pressure to formulate ideas. Instead ideas were blended in cultural exchange and carried out in even more organic ways. Thanks for residency coordinator and colleague Giorgio’s participation, we started up a film project which contains significant potentiality for the future plan. 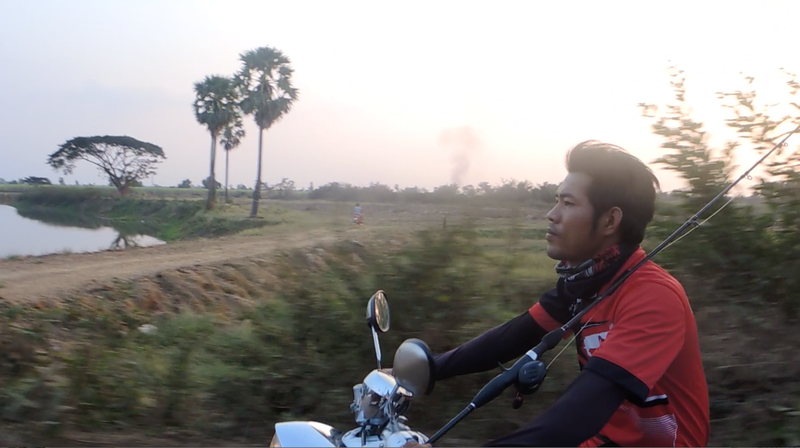 In two weeks, we carried the camera and tripod around the village to film Samrit family life. I feel happy that it eventually provided another kind of stage through camera lens. 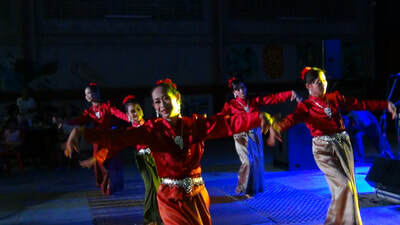 On this stage, Isaan culture could be shown from personal perspectives. All the things happened in these two months will be carried on. A sprouting seed was planted at the end of my residency. See you in the future, with full faith. ​Blog from Petra Revenue. Writer and Filmmaker. Sweden. When my father died I decided to make a film about him. It sounds simple but it wasn’t. 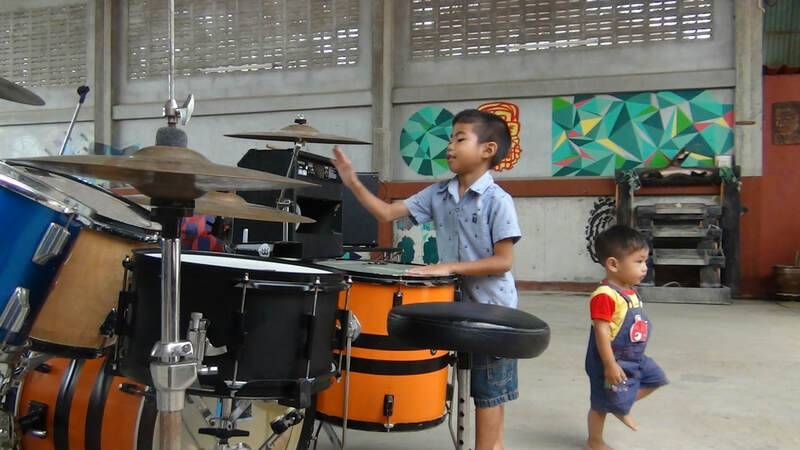 To be able to carry out the project I needed to stay in Isaan, because I truly wanted to experience what he experienced in the last part of his life. My dad lived in a village in northeast of Thailand and that’s also where his life ended, very far from Sweden. I knew he loved this area and I wanted to understand why. I didn’t get the chance to visit him these last years, I was busy with my own kids and my career as a writer and filmmaker. I didn’t know how to make it happen until I found Samrit Residency and applied. The village seemed to resemble the one I visited to attend my father's funeral. I did not expect the stay to have such an impact on my life and art on many levels. On, Art and Aek are super nice people, as everybody will tell you, they all took us in with Isaan hospitality. In the mornings I edited my material in the studio with king number 9 watching over me. During the days I filmed everyday life in the village. Details. The monks just sitting around by the temple. 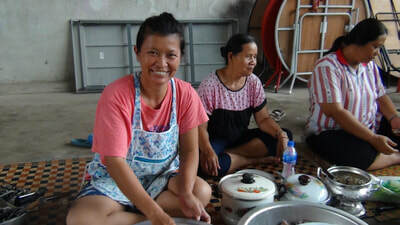 Women preparing food. The fires. Our daily walks. Visiting the local school. People calling our names and then hiding. The dogs. The cats. Going to the supermarket. Taking the bus to Korat for some city life. Our evenings. My partner Martin joined me on this journey, it was our first long trip together and we were still very much in love. This trip became part of our love story too. We had wine and cheese by our room, or joined the family at their outdoor combined restaurant and kitchen. Every night we listened to the girls practicing traditional Isaan folkdance in the yard outside by Buddha. Preparing for a great party in the honour of On. I felt very connected to On, the mother in the family. I feel she really understood what I was looking for in my art and she suggested a few things that helped me get a closure. She brought us to see her sons rowing team, she let us feel like part of her clan and finally, she took us to participate in a funeral, which was a healing experience on a personal level, but also a grand final for my film. You could say she gave me the perfect ending. ​There is something here that transcends life. People always fear changes and find themselves stuck in a clockwork mechanism. Slowly but inevitably. And then one day they look at their routine, at themselves and wonder what happened, where is their future, what went wrong, when exactly it all turned. What about their dreams, their passion. This place is no paradise, is not perfect nor close to it, tradition, mindset, lifestyle. It is primitive and simple. But there is some sort of peace, there you enjoy solitude of spirit and see the time sweetly walking before you. You might be unable to have a conversation with most of the villagers but you can see their hearts and feel their kindness. This place made me think about priorities and decisions, and had a huge impact on me and my artwork. This is the real Thailand. 'I observed rhythm of life within the culture through which I explored local histories' PHaptawan Suwannakudt, Sydney. I arrived in Sam Rit residency with no plan and expectation. I basically allowed climate, surroundings and people in the community who went on with their daily routine to have governed my pace. I observed rhythm of life within the culture through which I explored local histories. Newly open Korat house and visit the inaugural exhibition which showed print media work of Ajarn Surichai Siriboon. 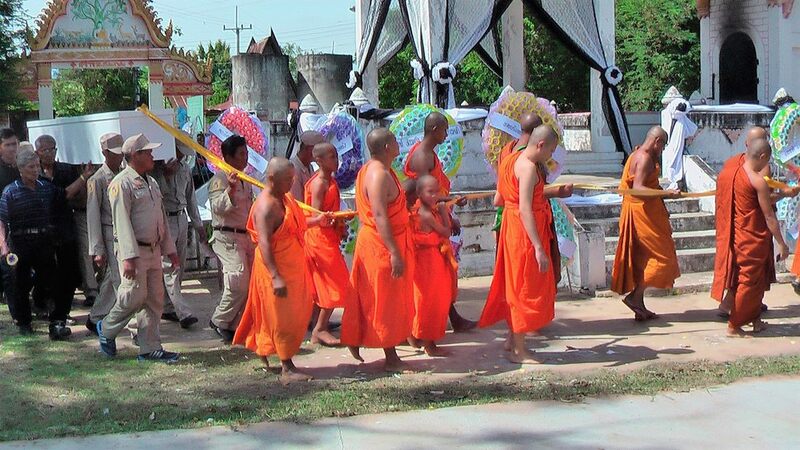 Village life and locals’ hospitality and enjoyed hearing stories from elders at Wat Sam Rit Tawan Tok and Wat Sam Rit Tawan Ork during ordination ceremonies. I conducted workshop to secondary school students at SamRit vitayakom in which I engaged an English class and conducted group session on drawings. Students took turns to speak about their work. I feel very honoured and proud to be one of a growing list of Artist residents to have experienced Sam Rit. Before I left, I was asked curiously by several friends and family - What is a residency? I described the opportunity as a unique time and space to contemplate and respond creatively to a new and fresh environment. It would be an opportunity to revive, inspire and nurture my artistic goals that all too often becomes clouded and jaded with daily distractions. I was correct! Yet my residency at Sam Rit gave me the freedom to realise far more than just artistic outcomes. I was fulfilled both artistically and holistically, and I know my husband Geoff who joined me made the very best of the location and time to enjoy his love of photography, reading and exploring, in a welcoming and unobtrusive environment. We thoroughly enjoyed immersing ourselves in this community, walking the streets, exploring unfamiliar paths, eating at the local family restaurants, visiting monuments, markets, temples and nearby archeological sites, riding the bikes, watching the kites flying, engaging in animated, gestural conversations with the locals and simply absorbing the sights, sounds and smells of an authentic Thai village. The residency is a very friendly, relaxed and unpretentious, professionally run family enterprise. The Thai people are incredibly warm, optimistic and generous people and we experienced their hospitality from the moment we arrived. ‘Art’, the program coordinator, kindly picked us up from Bangkok where we headed off for a longer than usual 5 hour drive up-country (due to the very heavy holiday traffic) When we finally arrived, quite late, we were warmly welcomed by Lindsay and his wife On, who are the backbone of the Residency, who met us with a drink and we relaxed for a while. They introduced us to Program Facilitator Ek, and other members of the family. Nothing was too much trouble, and we felt very comfortable in our strange new surroundings! Due to good timing we also had the pleasure of meeting other members of the extended family who were in Thailand for the holidays during our stay. 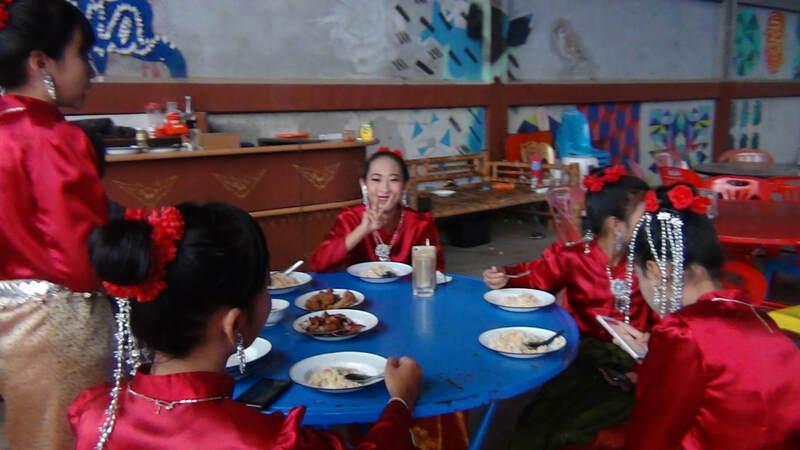 Together we had the most memorable evening, when we were officially welcomed to the village with a celebration of music, lots of food, drinks, local residents and traditional Thai dancing - we will never forget it! During the residency I spent many productive days in the studio producing some often, unexpected outcomes! My interest and fascination for the Thai script prompted me to experiment with Calligraphy, which then resulted in me using these shapes as the inspiration behind a layered, collage artwork depicting my fourteen days in Sam Rit, using left over materials found in the studio space from previous resident artists. From these, I began to explore poetry and quotations. This time to ‘play’ and follow threads of inspiration is the very heart of a residency objective. Aside from drawing and sketching opportunities both locally and in nearby Phimai, I also found myself painting with watercolours on the river bank; Playing with T-shirt designs; Impromptu portrait drawing and I was encouraged to leave my mark with a ‘street art’ style artwork of Ek and Art on residency walls! I’ve returned with fresh ideas to pursue at home that include a childrens Thai/English counting book and complete some of the other illustrations I had started on. One of the absolute highlights of our stay was the two mornings I spent at the local Sam Rit Village School. Elysha, who is an also an artist and the programs Operational Director, and Art helped to coordinate this prior to our arrival, so the children were very excited in anticipation of our visit! It was quite an event visiting the school of about 150 students, and Art was instrumental in helping us communicate with the School Principal, staff and the gorgeous students we met at the school. On the first morning I shared my children’s book, ‘Me & My Family Tree’, with a class of around eighteen 8 year old students. This was such a thrill! The children listened to Art attentively as he translated my book, but I think they were more excited to receive the activity booklets I had prepared for them. They were intrigued by the drawings I did on the blackboard of well-known Australian animals. Lots of photographs were taken recording our visit by both Geoff and myself, and the enthusiastic teachers. Geoff was a hit with the children on the sidelines, engaging them with technology, an ipad - something quite foreign to these children, and entertaining them with the apps! We returned the following morning to the classroom, this time to share a craft activity and also do some portrait drawing, lovely ‘Nui’ was my volunteer. Children around every corner entertained us with song and dance and big smiles! Leaving the school, my face, heart and soul were just bursting from such a rewarding experience! I would thoroughly recommend future residents to incorporate a visit to the school - it was such a delight! The following day some children stopped on their way home from school at the residency gates to yell out, “Hello! See you tomorrow!” in English. Pure joy! 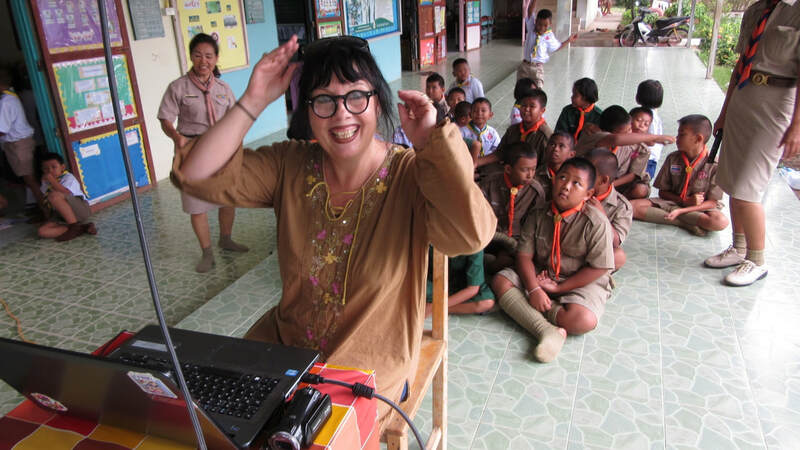 We were privileged to meet Emma Sedlak, who was also on residence during our time at Sam Rit. Emma holds a PhD and is a writer, poet, and actress. It was so lovely to spend quiet time in the air conditioned Studio working on our own projects, lunch in the courtyard, casual walks, bike rides and dinner at the end of the day at the local family restaurants, and our orientation outings and shopping trips. I really enjoyed reading Emma’s beautiful words and observations of the residency, as they enhanced and informed my own experience. A valuable exchange of insights, as writing and journaling is also an important part of my arts practice. Among the many lessons I learned, Sam Rit made me acutely aware of the verbal interactions, subtle body language, gestures and our innate desire to ‘connect’ with others despite communication and cultural barriers. How very important it is to maintain a sense of humour; to be patient, kind, and to explore the world ferociously! This is the type of baggage I wanted to take home, and as I prepared to leave the residency at the end of our stay I realised that rather than leaving Sam Rit, I didn’t want Sam Rit to leave me! ​My two month stay at Sam Rit was a tremendous experience. I would recommend it to anyone who is interested in truly getting a feel for the beauty of the landscape, history and lovely people of Thailand. This was my first trip to Asia and is a complete emersion into Thai culture and life. Initially I was a bit overwhelmed by the dramatically different environment I found myself in but by the end of my stay, I felt such a deep appreciation for everyone who had welcomed me with open arms. It was as if I had a new branch of family who I will never forget. I decided to just be open to experience and soak up as much as possible and said yes to every trip suggestion and every new and wonderful dish of food. It was a wild and wonderful adventure. Everyone I met there welcomed me with kind, generous and friendly curiosity. I spent the first month alone at the residency but everyday my kitchen and table was full of food, lots of Chang beer, laughter and stories. Art was an incredible guide and delightfully funny and sweet. On and the rest of the family worked tirelessly to ensure I had everything I needed, took me all over the place, introduced me to what seemed the entire village and made me feel that I was so incredibly welcome. They shared their culture, their food from the gardens and ponds, their life stories and welcomed me into their homes and lives. I miss them and think of them often with great fondness. I have read some of the detailed reviews from other artists who have stayed there and know that they too have experienced the warmth I did. This experience has informed my work in ways I would never have expected and continues to do so. Living and working in New York city in the hustle and bustle of anonymity could not be further from life in the rice fields and temples, lizards and elephants, but it was exactly the reminder of how simple community and family, love and laughter, food and traditions bond many people together in ways that should be echoed everywhere. One day I would love to return, not just to again see the vibrant colors of the costumes, the markets, the flowers, taste the fabulous fiery food and roam the ancient temples, but to laugh and hug those amazing friends, especially my Thai sister! ​My stay at Sam Rit Residency was a challenging yet rewarding experience which allowed me to improve my skills as a musician and write in solitude. Coming from a big city like Sydney, being alone in a small village is a contrast let alone one in a completely different country! Lindsay and Art kindly picked me up from my hostel in Bangkok which was a mid-way transition to what Lindsay referred to as “the real Thailand”. In our car trip he bought a McDonalds hamburger stating that it is difficult to purchase this kind of food where they live. The evening I arrived I was met by village locals and family members who held a party celebrating my arrival and farewelling Gisela Romero and her partner Hector. 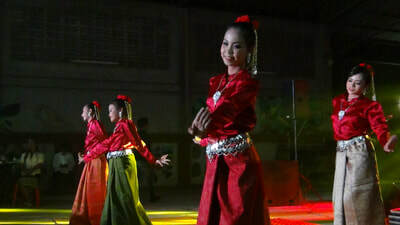 Traditional Thai dancing, amazing food and plenty of Chang beer filled the residency grounds. After Hector and Gisella left I was the only artist in the residency, and the only “farang” (foreigner) in the town. This meant that I was subject to many stares, smiles and being told I was beautiful (or “suway”) as I rode through the town daily on the bicycle slowly taking in my environment. I practiced guitar religiously, as it was one of the only things I could do inside with the air conditioning! I took pictures and filmed some footage of the rice fields, houses, alleys, hounds. Thai people have an interesting relationship with the street dogs who in Australia would be taken to a pound and possibly put down. People respect each others space and the dogs, though shaggy and derelict, roam happily and freely. The restaurant across from the residency (which has amazing food for about $1 USD per meal) actually let a dog have puppies in the courtyard. All of these things about Thailand may sound gritty and they are as I still see them now. The residency adheres to a loose time schedule. You must learn to be flexible, or more importantly, be patient. Thailand tests your patience. But everything always works out even if there is no apparent logic to the situation. Just watch the construction workers on the roadside who wear no helmets or harnesses. Thai people operate in a more intuitive fashion. There is no point in being stressed in Thailand, but it will test you, until you just have to chill out and go with the flow. I wrote a song at Sam Rit called “Counting Sheep” which I recorded on my EP when I returned from my visit. I release my EP just a few weeks ago. Now I am teaching English in Chon Buri Province. 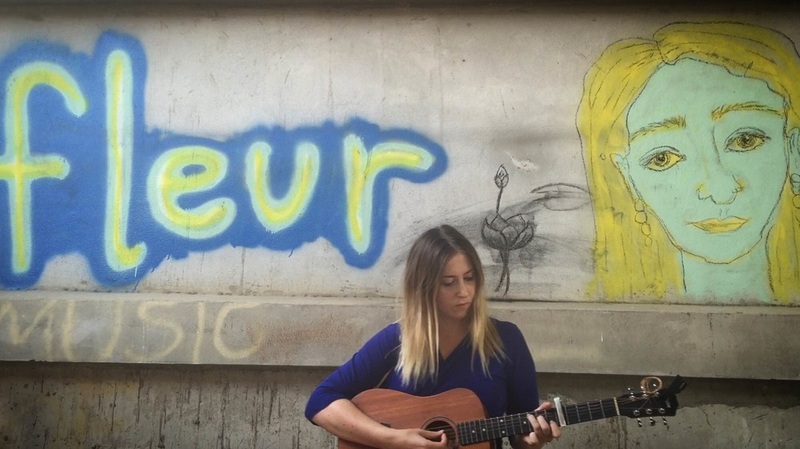 ​To be offered the opportunity to do an artist residency overseas was incredible, not in my wildest dreams would I have ever thought something like this would happen to me. I was a stay a home wife and mother for over twenty years, when my children had grown up I studied high school art and started creating, exhibiting and teaching craft based art using predominately recycled materials. I have travelled very little, going overseas a few times with my husband, never on my own and never to Asia. So this residency has been a life changing experience for me. I was thrilled when Flying Arts Alliance, a Queensland based arts organisation, asked me to undertake a cultural exchange with local ladies in Sam Rit, North Eastern Thailand to look at making art/craft products from local waste materials. The project was supported by the Australian government through the former Australia-Thailand Institute, now merged into the Australia-ASEAN Council, and part of the Department of Foreign Affairs and Trade. The Residency itself is well set up with a studio area and large undercover outdoor work area. I utilized both when working with the local ladies. They were a joy to work with always happy and enthusiastic to try new things, laughing at any mistakes and not being discouraged by them but learning from them and moving on. The final exhibition was very impressive both in the quality and quantity of works. The local people were so welcoming and just accepted me into their community always greeting me warmly. I enjoyed going to the Thursday morning market in the street in front of the Residency each week. I would buy fruit for the week and also purchased a few other things. I always felt they were looking after me and never had any concerns about being overcharged because I was a foreigner. In fact a couple of times after the stall holder told me the price and I bought a few items they gave me a discount even though I had not asked for one. Another time when I picked up a hand of bananas to buy them the stall holder showed that a few of the bananas had dark patches on them and gave me another hand of better ones. I enjoyed not cooking during my time away, although the Residency does have a communal kitchen, as the shop and restaurant across the road had great food at a very reasonable price. It was also a great opportunity to interact with the locals. I also loved the range of local fruit some of which I had never seen before and it was quite an adventure trying it all. I visited the school a few times and worked with students to teach them a couple of simple things that can be made from recycled materials and showed them some of the things I had been making with the local ladies. The welcome at the school was overwhelming they were so appreciative and enthusiastic. I would recommend a school visit to any visiting artist as a most rewarding experience. I was thrilled a few days later when I saw some of the teachers and students with a display of the things I had taught them to make at a local festival and was of course again very warmly greeted. People wanted to take photos of and with me as much as I wanted to with them. As a foreign visitor in an area that is not visited by tourists you are treated as an honoured guest by the local community of genuine friendly country people. It was a rare treat and great honour to have been able to experience genuine rural Thai culture and to be part of this community sharing in the lives of the locals for a time. It was a beautiful experience that will stay with me all my life, so very different from the typical tourist experience that one has when simply holidaying somewhere. ​When I arrived to Sam Rit Residency I felt like I have been here before. The reflected light from the windows on the floor received me, also the wind moving memories from other artists who came here before me. Sam Rit is not like other Artist Residency, it is a place not only for producing art works but a place to live, share and celebrate. The Village is a beautiful and peaceful place, from the old inhabitants to the cute children, everybody smiles, everybody greets and everybody seems to be glad. Sam Rit is for an artist who wants to explore, who likes adventures, who is willing to try different flavors, who has the eye to find treasures and who has the soul to encounter with the essence of simple things of life. For me as an artist was a time to make many drawings, to think about future art projects, and as a human being was a time to plan life projects and also a time to get along with the sounds of the geckos, doves, cattle, pigs, birds and insects. Also was a time to explore a new culture and being close to new sounds, flavors and smells. The Temples are amazing, the celebration and the three days Festivals are full of colors and flowers arrangements. People come and go all the time, the doors at the residency are open all the time, also the hearts of Lindsay, On and Art and their extended family who are always ready to help and share with the artists and their companions. 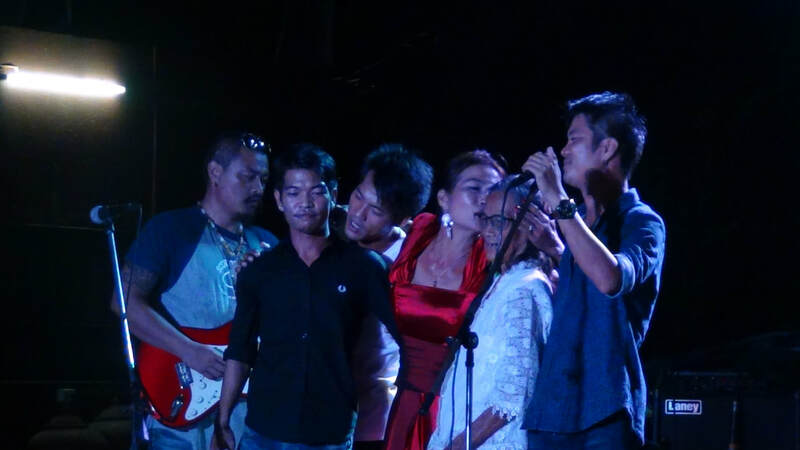 Thanks to them, the experience at Sam Rit is huge and each artist can embrace the Thai culture in a different level. We met everybody at the Village, from policemen to politicians, from Jin and her family at the restaurant to teachers and students, from neighbors to kids. The spicy and the sweet coincide in the beautiful face of a child with enormous eyes and a big smile. Women laugh while they cooked, men drive trucks full of ornaments, and children go to school with their grandmothers. Everything in Sam Rit is a dance, a hand movement, also rice, also green, also light, also the saffron color of the monks robes, the velocity of a bicycle, the convenience of a sandal, freedom, coconut, pork and pineapple. In the Village time flows. I will miss everything; my husband Hector will also miss everything. Sam Rit is a place of happiness, tolerance and generosity. Gisela Romero, Visual Artist from Venezuela, March 2016. Upon arrival it became instantly apparent from first meeting Art this was going to be an experience of a lifetime as I became a subject to a receptive welcoming. Art was great fun, one of the kindest and selfless people I’ve ever met, a true friend and great guy. He made me feel so welcome and comfortable from the get go. Driving to the residency really got me excited as it was starting to settle in I was here and able to have access to resources and locations I never would of thought was possible. Through the residency I was able to grow as both a person and artist. Sam Rit contains a promoting environment for practitioners, the studios, the accommodation, all the activities and the authenticity of the location, contributes towards your experience and how you respond to that in your work. My work is often driven by the anxieties created by globalization, and I often investigate issues of anthropology in relation to distinctive behavioral cultures, but my work from the residency has evolved from the foreign experience and has extensively broadened the subject matter and concepts surrounding the work. At Sam Rit the joyful experiences leave you waking up each morning with the smile on your face wondering what the days hold ahead. drinking with the locals, visiting the numerous attractions and temples, or a day in the studio. What ever the days hold you will be overwhelmed by the community spirit. Once I understood the extent and shortcuts of getting over the language barrier, I was not restricted, the food, the people, the culture and the ideology of living in rural Thailand fed the progressive attitude that contributed to development of my work. The whole team of staff that were involved with the residency are better off being called family, because that is the way you feel being involved with some of the most genuine and overall amazing people involved. On and Lindsay are the foundation to which the best experiences you have are built on, welcoming and approachable are a few of the words to describe their unconditional kindness, giving you complete freedom of the residency letting you tailor it towards your practice. 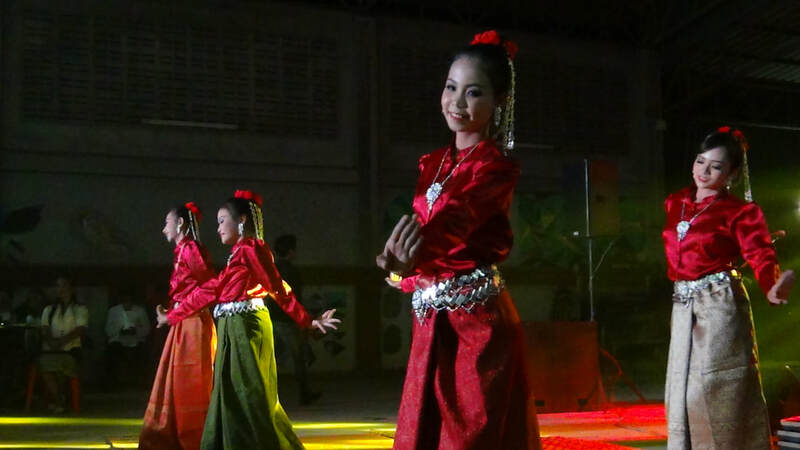 You are able to experience the growth of Thailand and the developing ways of the rural villages and how important tradition and other aspects of their culture. I gained a lot more than I expected and inspired a whole body of work which will stay with me throughout my active practice. I hope to take my experience, artwork, new friends and life lessons with me forever. I am truly grateful and humble to have the opportunity to attend the residency and will never forget the people and experiences I was subject to throughout the whole experience.